Malala Yousafzai became an international inspiration when she was shot by the Taliban in Pakistan after insisting that she had a right to attend school. The world has watched as she has gone on to not only recover from her injuries, but to continue to be a passionate and eloquent speaker for the rights of girls everywhere. 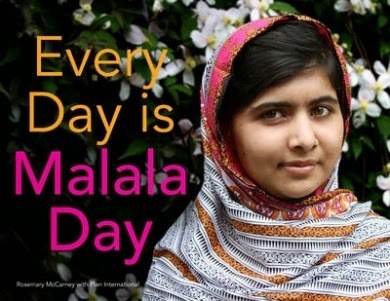 Every Day is Malala Day illustrates the impact this one, brave young woman has had around the globe. In this book, Rosemary McCarney and Plan International share a mesage from girls around the world to Malala Yousafzai, thanking her for what she has done and talking about what it has meant to them. The message, shared as a letter, is accompanied by photos of girls and young women who identify with Malala’s message from countries including Nepal, India, Liberia, Myanmar, Paraguay, Kenya, China, Nicaragua and the Philippines. The book concludes with an excerpt from Malala’s 2013 speech to the United Nations. The picture book is a simply-worded letter accompanied by a collection of photographs, but it has an incredible impact. I confess to tears in my eyes as I looked at the faces of these girls from such a variety of backgrounds and had to acknowledge that so many girls struggle to have access to education, something that I consider to be a basic human right. Every Day is Malala Day is the perfect way to introduce younger children to not only Malala Yousafzai’s story, but also to open a discussion about the importance of education and the inequality experienced by so many girls around the world. It is also a testament to the impact that one person can have if they stand up for what they believe is right. Proceeds from the sale of this book will be donated to Plan’s ‘Because I am a Girl’ Fund.